The illustration below indicates where each body measurement is taken on the figure. The measurement 4 and 6 on the back, and 9 and 10 on the front, are taken from side seam. 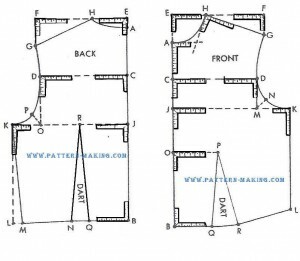 The measurements 2 and 8 are taken from armhole to armhole. Cut out dart, then slash from P to S [2” from N] and spread needed amount at P, pivoting at S. [this also reduces armhole slightly].